The Tale of Peter Rabbit was written by Beatrix Potter in 1902. 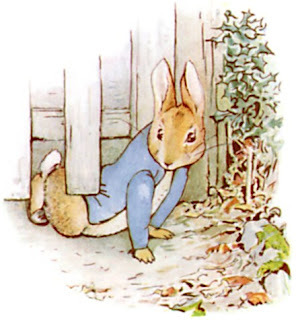 Potter incorporated Peter Rabbit into later stories as well. The Tale of Peter Rabbit is a great example for illustrating various story structure models. It is helpful to utilize examples when discussing story structure. Many screenwriting, plot, and structure books use movie examples. In addition to examples of longer works, I think it is good to see how a simple, short story also fits any of the story structures. I like the Tale of Peter Rabbit because it is cute, well-known, and perfect for illustrating story structure because of the basic plot. And then, feeling rather sick, he went to look for some parsley. But round the end of a cucumber frame, whom should he meet but Mr. McGregor! Presently Peter sneezed--”Kertyschoo!” Mr. McGregor was after him in no time. After a time he began to wander about, going lippity--lippity—not very fast, and looking all round. He went back towards the tool-shed, but suddenly, quite close to him, he heard the noise of a hoe--scr-r-ritch, scratch, scratch, scritch. Peter scuttered underneath the bushes. But presently, as nothing happened, he came out, and climbed upon a wheelbarrow and peeped over. The first thing he saw was Mr. McGregor hoeing onions. His back was turned towards Peter, and beyond him was the gate! His mother put him to bed, and made some chamomile tea; and she gave a dose of it to Peter!